TOYS Land & Gift Centre deals in imported and local toys and gift items at whole sale and retail rates. 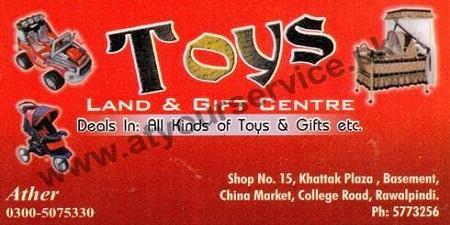 TOYS Land & Gift Centre is located in Khattak Plaza, China Market, College Road, Rawalpindi. It deals in imported and local toys and gift items at whole sale and retail rates.